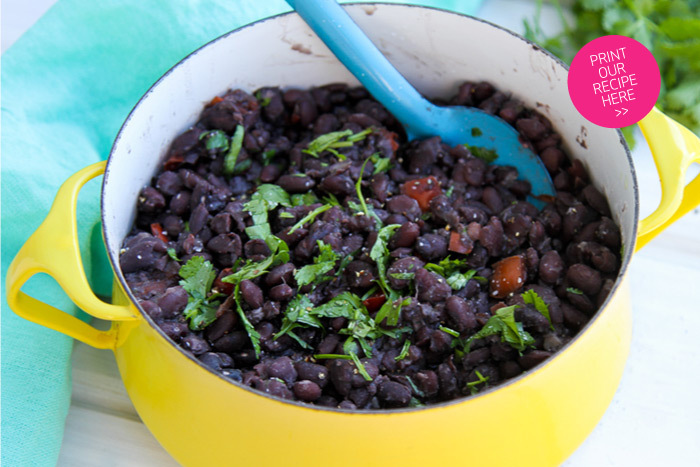 These island black beans are flavorful and comforting. Cooking dried beans is easy using a multi-cooker, but feel free to use pre-cooked canned beans, if desired. If using canned beans, Simply sauté the aromatics, add the cooked beans and spices, and simmer until the flavors meld together. 1. In a multi-cooker that can both sauté and pressure cook, sauté the onion, pepper, and garlic in olive oil until the onion is translucent. Add the white wine, and simmer until it fully reduces. 2. Add the dried black beans, two bay leaves, oregano, cumin, Kosher salt, pepper, and brown sugar. Top off the mixture with 6 cups of water, and then follow your pressure cooker instructions. 3. Bring to pressure, and then cook for 25 minutes. Once the pressure has fully released, carefully remove the lid according to your cooker instructions. Discard the bay leaves. 4. Taste the beans and add any additional seasoning, as needed. 1. Sauté the onion, pepper, and garlic in the olive oil until the onion is translucent. Add the white wine, and simmer until it fully reduces. Add the bay leaves, oregano, cumin, salt, pepper, and brown sugar. 2. Add the canned beans to the pot along with 1/2 cup of water. Simmer on low for 15-20 minutes to allow the flavors to combine with the beans. Discard the bay leaves and serve. 1. Soak the dried beans in water overnight. In a large saucepan, simmer the soaked beans in 6 cups of water for 1 hour, or until tender. Drain away an excess water by placing the beans in a colander. 2. Meanwhile sauté the onion, pepper, and garlic in olive oil until the onion is translucent. Add the white wine, and simmer until it fully reduces. Add the bay leaves, oregano, cumin, salt, pepper, and brown sugar. 3. Add the cooked beans back into the pot along with 1/2 cup of water. Simmer on low for 15-20 minutes to allow the flavors to combine with the beans. Discard the bay leaves and serve.